The presence of Calphalon knives in someone's kitchen makes it complete. Whoever will be spending time cooking in that kitchen will find it easier and fun cutting and chopping the ingredients using these made-from-China knives due to their sharpness and the control they let you have while they are in your hands. Having them in your kitchen totally improves and motivates your cooking. What is a Calphalon Knife? Manufactured from the year 2015, Calphalon﻿ SharpINTM Cutlery comes with Self-Sharpening Technology features. This is a set of knives that come with a knife block which is lined with inbuilt ceramic sharpeners. The ceramic sharpener automatically sharpens straight edged knives after each and every use. With every pull and replacing of your knife back to its knife slot, the edges come into contact with the ceramic sharpener and sharpen the edge. They also come with contoured handles to ensure a comfortable balance. The handles are later labeled so that you pull the correct knife for your current kitchen need. Each set includes an assortment of knives for you to choose from in the kitchen be it slicing, dicing, chopping or mincing, in the course of preparing food. Each set also includes kitchen shears, which apparently, not used for its intended purpose because not so many people know how to use it in the kitchen. To ensure that the blades remain a longer time with sharper edges, the knife blades are made of high-carbon non-stain German steel. However, steak knife blades are made from Asian steel. To make the German steel, forging method is used whereas the stamping method is preferred for the Asian steel. 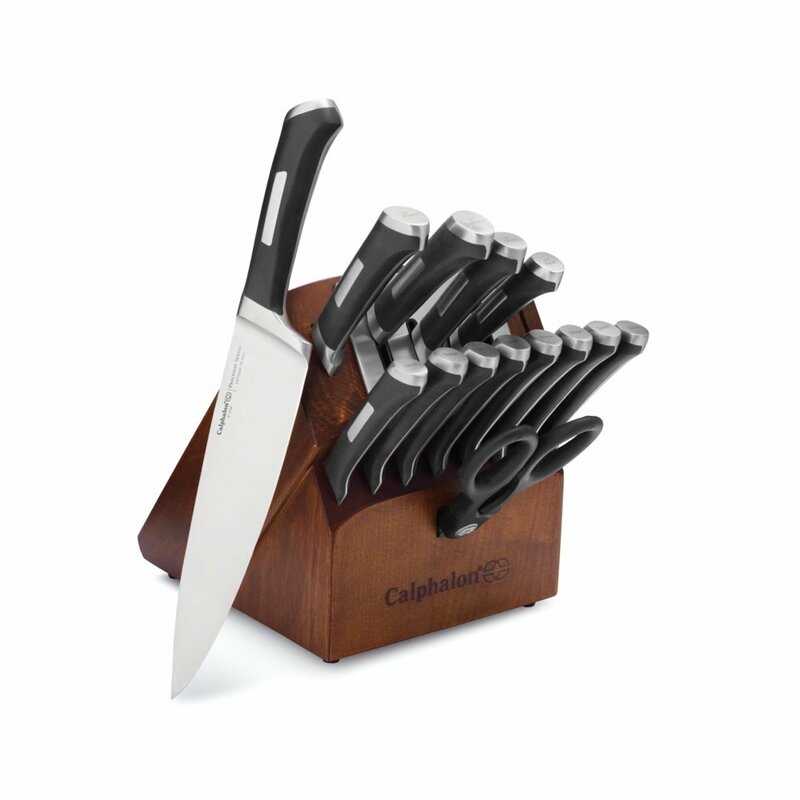 Calphalon SharpINTM Technology is available in 3 series; Precision, Contemporary and Classic cutlery lines. The shape of the blade. 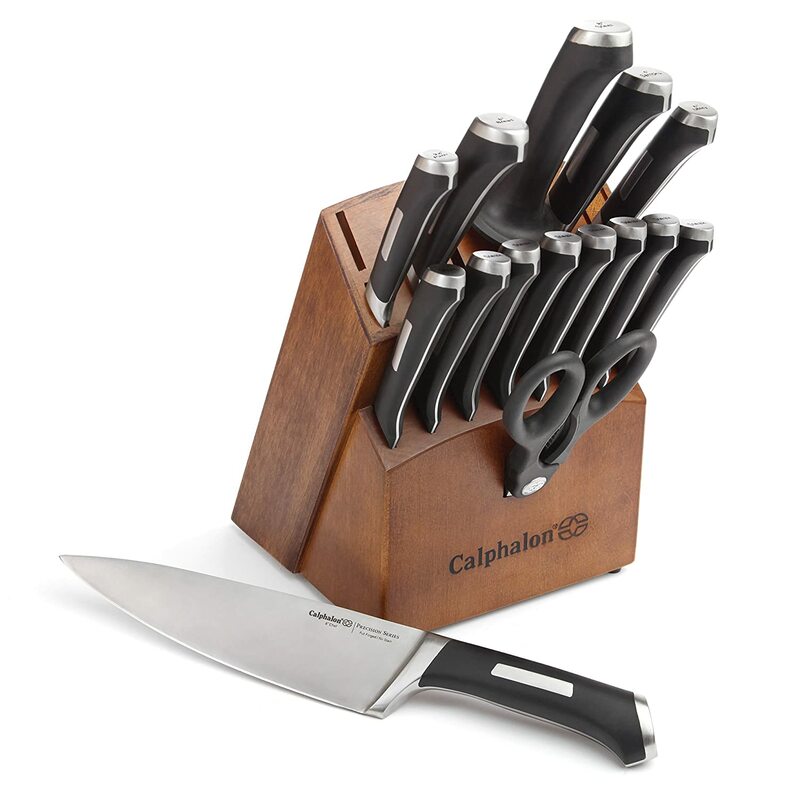 - Calphalon knives come in various shapes to cover all your knife-uses needs. The blades are sturdy, have a better curve and have a straight part next to the handle. These are the properties of a good knife that Calphalon knives possess. Calphalon Company ensures comfort by making all types of perfect handles so that you get a good grip while working. The knife handles are ergonomic and either added rubber or textured for a firmer grip, even with wet hands. Wooden handles add aesthetic value to your knife while plastic handle with withstand extreme conditions. Take your pick. They are made of good quality steel. The type of steel is fully dependent on the task that you have at hand. A good steel should be corrosive resistant, hard and tough for durability, but a little flexible so that it doesn't break easily. 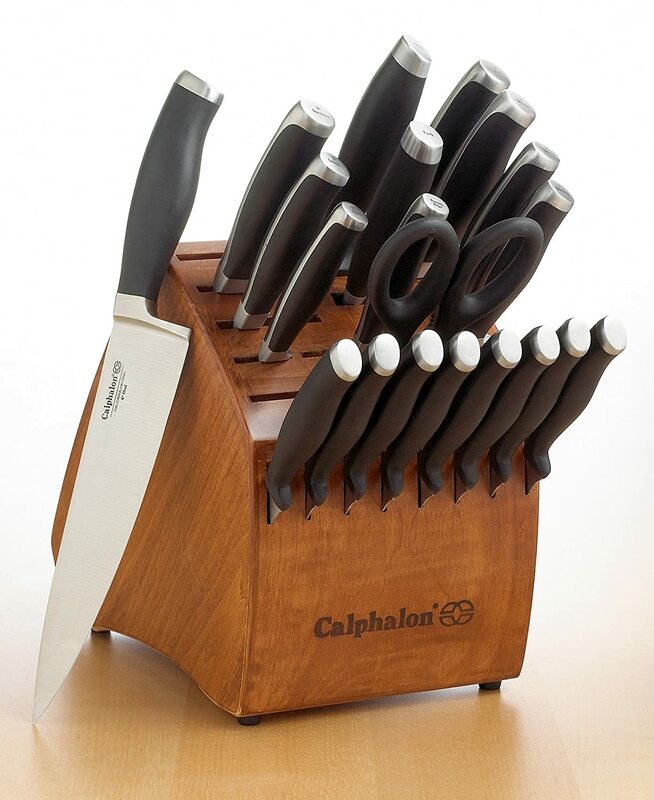 Calphalon knives come with a knife block that ensures you get them back together, in an organized form, and are better protected. These knives are also easy to clean, dry and store. The knife weight determines the effort that will be used in cutting. These knives come in just the right weight for you to not tire by applying excess force when using. Longer and larger blades, the Calphalon type, ensure that you cut something with a few cuts and with less effort. Having a variety of knives in your kitchen will make sure that you have a knife for every culinary purpose. This way, your food preparation will be more professional and specialized. These knives have a great design and offer convenience. They are easier to maintain so that you do not go the extra mile of getting a separate sharpener. Sharpening knives is also a tiresome act, providing you will keep sharpening from time to time. Calphalon knives ensure that your knife is always ready to use. 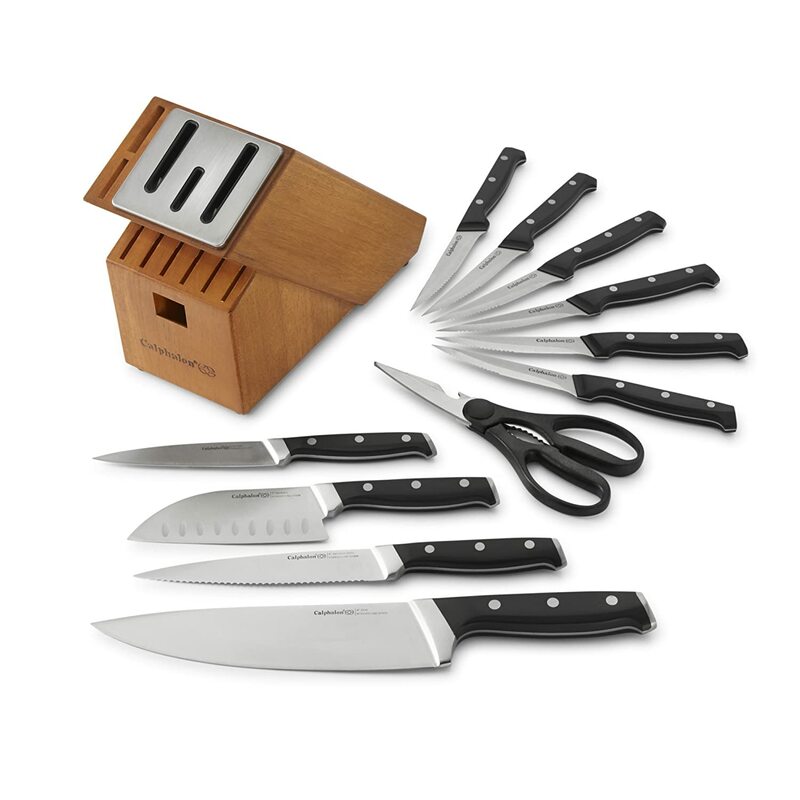 This 12 piece set include an 8" chef's knife, a 6" serrated utility knife, a 5" santoku, 4.5" parer, 6 steak knives, kitchen scissors and a sharpening knife storage block. The knife block has a built in ceramic sharpeners which automatically sharpen straight edge knives after each and every use. The blades are made from forged, high-carbon stainless steel. They have a full tang design to ensure strength and balance. The knife handles are triple-riveted and contoured for a secure and firm grip. The handles are also labeled for easy identification, when inside the block. The block is self-sharpening so that your knives are always ready to use. Do not come with a bread knife. This set includes 8'' chef's knife; 8'' bread knife; 8'' slicer; 7'' Santoku Knife; 6'' utility knife; 6'' fork; 5.5'' tomato or bagel knife; 5'' Boning Knife;5'' Santoku Knife; 4.5'' parer; 8 steak knives; kitchen shears; and a richly stained maple wood knife block. The knife block has an inbuilt knife sharpener made of ceramic. It automatically sharpens knives after every use. The knife blades are made by forging, of high-carbon German stainless steel. The 8 steak knives blade are made by stamping, from Asian steel. The handles, labeled for easy identification, are contoured and ergonomic; made of plastic making the knives lightweight. The knives have a full tang design, for strength and balance. The knife block ensures that your knives are better organized together. The 8 steak knives do not have the inbuilt ceramic for self-sharpening. The Precision set maintains sharpness at 20% times longer than the Contemporary cutlery. The blades have been precisely reduced for maximum edge retention and above average performance when chopping, slicing, mincing and cutting. The knife blades are made of high-carbon forged stainless German steel. However, for the steak knives, they are stamped out of Asian steel. For balance and strength, the wooden handled knives are made with full tang feature. The handles are uniquely bar-riveted. Each knife is labeled accordingly to avoid hustling when picking the desired knife. This set has a full selection of knives for your every cooking needs. Precision-horned to ensure maximum edge retention. The steel is good, and the weight is heavier and good for gripping. Comes with 3 empty slots with no information about the types of knives to fill them with. This set was made with counter top space-saving in mind. This precision sharpIN set has a block with inbuilt ceramic sharpeners which sharpens straight-edge knives before and after every use. The knives have been made with high-quality materials to ensure durability. The blade has a bolster, is tangled and forged from high-carbon, German stainless steel. The steak knives are the only ones made from stamped Asian steel. Handles have been labeled for easy identification. They have contoured ergonomic handles for a comfortable balance and secure grip. They have some weight, so less pressure is applied when using the knife. The blades have the right flexibility. The paring knife is not shorter, to the desired size. Designed for optimal edge retention in mind, this 15 piece set features a sharpIN technology. The knife block has a built-in ceramic sharpener that sharpens your knife for every time you pull it out. This ensures good performance with every use. The blades are made of high-carbon stainless German steel, with bolster and full tang for good balance and strength. The handles are bar-riveted and labeled so that you pick the right knife from the block. The set ensures that you have a knife for every culinary purpose. The block has a free non-sharpening slot for adding new or favorite cutlery. The set includes 8 Steak knives; kitchen shears; 8-inch Chef's knife; 8-inch bread knife; 6-inch santoku; 6-inch utility knife; 3.5-inch parer; and a knife block with 1 extra slot that doesn't have a sharpener. All the knives have some nice heft, even the Paring knife. The handle is rubber gripped, so it doesn't slip. No cons, or negative reviews at the moment. 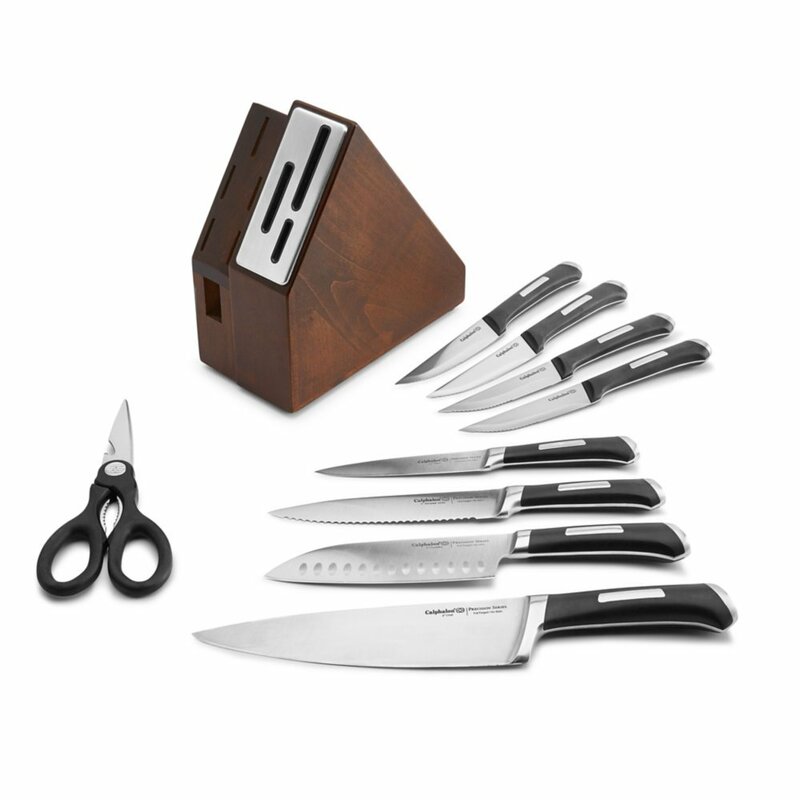 The Contemporary Self-sharpening 20 Piece Set will be perfect for those who love the plastic handle and lightweight knives. This set also comes with a very attractive knife block. Furthermore, the set has a variety of knives to choose from. The classic 12 piece set is good for basic kitchen operations. The bread knife is the only shortcoming but can be bought separately. The precision self-sharpening 15 piece set would be the best choice. All the knives come with the expected size with some weight to ensure that you only apply less pressure. The handle has rubber grip so that it does not slip when using.